MDF pool tables are lightweight, user-friendly & great value. Designed for home use, they're fun for the entire family. They come in a variety of sizes, styles & finishes. Browse our huge range & find the perfect table for you. Slate bed tables give the best performance for skilled players. They feature a slate playfield & quality components for quality play. We hold the biggest range of slate bed tables in the UK, with thousands of finish & cloth variations. Save space with a folding pool table, ideal for busy families. Built to fold flat for storage, they can be put away after use. The folding systems on these tables make them safe, stable & great to play in homes of any size. Open new income streams in your venue with a coin-op table. They're robust & hard-wearing, perfect for constant use. Built for pubs, clubs & venues, these tables make a fun, reliable addition to any public space. Pool dining tables quickly convert from pool to a dining table. These elegant dual-purpose pieces of furniture switch in moments. You can compromise on space without losing game quality. With all the performance of conventional tables. 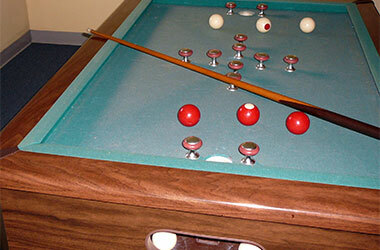 American pool tables in a range of styles & finishes. Fitted with American-spec speed cloths, wide pockets & pointed cushions. American tables are bigger & faster for a more exciting game. We stock a huge range of tables for all budgets. Our range of luxury tables is the connoisseur's choice. See the finest, most unusual and most exclusive pool tables around. These are the tables that our most discerning customers buy for their games rooms. Browse the collection. Buy a pool table built to be used and stored outside. With treated timbers, waterproof materials & special rot-resistant cloths. They're ideal for patios, deckings & gardens, allowing you to take your game into the sunshine. These are the traditional British pub tables found in many pubs. Tough, sturdy & durable, they can be fitted with coin mechs. These British-spec tables, with quality cloth & cushions, will make any pub player feel right at home. Have your pool table professionally re-covered with any cloth. For pool table cloths that are faded or threadbare. Choose a cloth from our range in your favourite colour, specification & nap. Transform your table today. Our technicians can move and level your table with no fuss. Whether you're moving house or relocating your table, we can help. Heavy pool tables need careful handling. Ensure it's moved without damage & properly levelled. Smaller pool tables built especially for kids. Compact, easy to play & fun, they're the start of a great career! With a variety of styles & colours to choose from, you'll find the perfect table in our children's range. Take cashless payments on your pool table. Charge customers for games quickly & easily. You can open a new income stream with your pool table after adding a contactless payment system. Looking For Pool Accessories ? If you were wondering if you have enough room for a pool table, our experts let you know. Learn about the difference between American and British pool, including tables, cues, balls & playing styles. Our range of 6ft pool tables to fit your gaming space. View slate & MDF bed tables in various cabinet styles & finishes, with your choice of cloth. 7ft pool tables for the larger games room. Built to British or American spec, the 7ft table allows for a more skilful game - if you have the space! 5ft tables are ideal for compact homes. Built with MDF beds, they're a great option for family games & for aspiring younger players. Our smallest pool tables are just 4ft in length. Designed to take up minimal space, they work well in bedrooms & kids' games rooms. Black is the classic colour for pool tables all over the world. Browse our range of black-finish tables for some noir games room style. Modern, contemporary & just cool, white pool tables are becoming the preferred option for in-vogue games rooms. 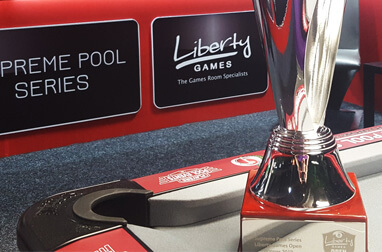 Liberty Games are the biggest pool table retailer in the UK, trading online since 2004 we were the first full e-commerce games room retailer. We have pioneered delivery solutions to allow our customer to order online with confidence - our specialist white glove delivery team are billiards specialists and have many years of experience. We also have a team of trained sales advisers available to help you with your purchase, who have actually played on many of the tables we sell and are able to help you decide which table is right for you. They can be contacted free on 0800 612 8180. We have a large range of tables available to buy online, so to make it easier to browse we have divided our range up into several sections - each representing a different area of the market. Alternatively our super search feature can help you locate a table by the exact feature you require, such as build (the type and colour of material the table is constructed from), cloth colour, coin-operation and many more. 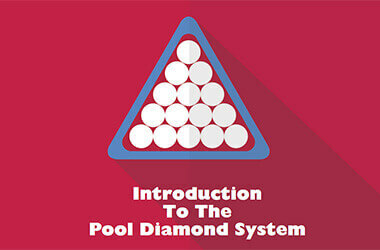 If you are new to the world of pool then please view some of our frequently asked questions, where we have tried to answer some of the questions we know people commonly have, including explaining the difference between slate & MDF (if you are looking for a cheap table then we would suggest MDF over slate for example), the recommended cueing room / room size and what accessories you new table will come with. These can be seen in the video at the top of this page or through the FAQ links at the bottom. If you would like to try a shot or two on a table before you decide which one is right for you, don't forget that we have a showroom - and although our space is limited in that we can't show every table - we have tried to carry an example of many of the different styles that are available. One of our most popular features that is exclusive to Liberty Games is our ability to show you your table in the exact cloth colour / build combination you wish to choose. Simply select from the option drop-downs on the product and the picture will dynamically update. We also carry the largest range of pool accessories in the UK, with a huge range of cues, lights, balls and much more. Please note that we not only deliver to the UK, but over the last decade we have exported to 93 countries world-wide, and are experts in safely and securely transporting our products over land, sea and air. Our pool table buyers' guide tells you exactly what to look for when buying a slate bed pool table for your home or business.